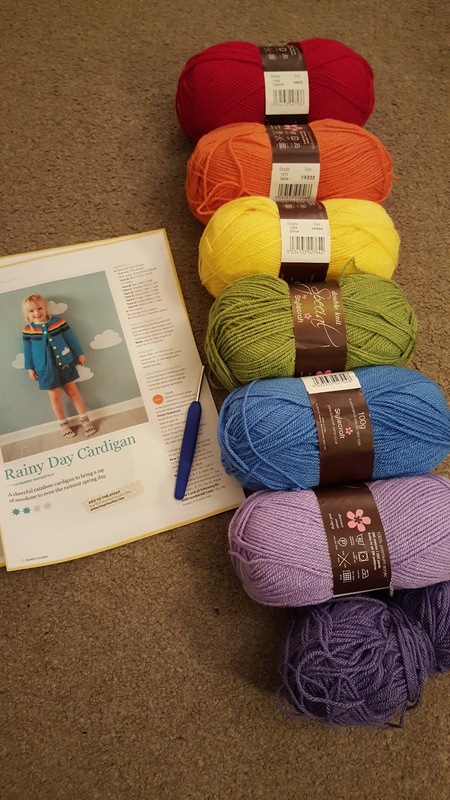 I fell in love with this cardigan after seeing it in last month's issue of Inside Crochet, and bought the magazine just so that I could get the pattern. 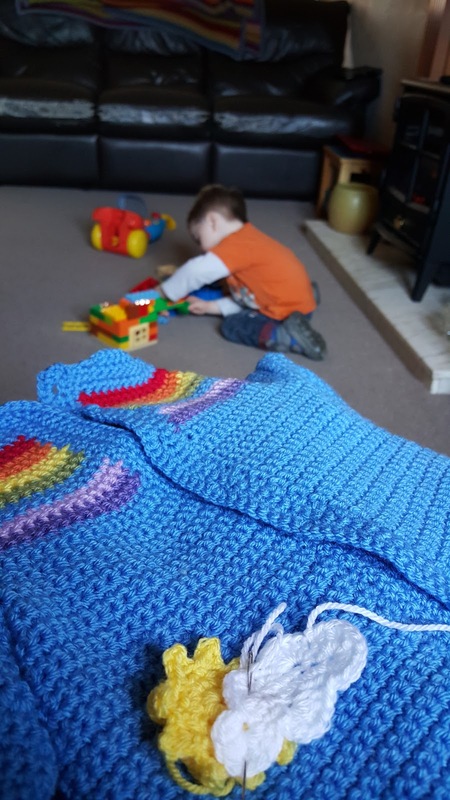 I had the perfect colours to make the rainbow in my Stylecraft Special DK yarn stash and set about making it straight away. 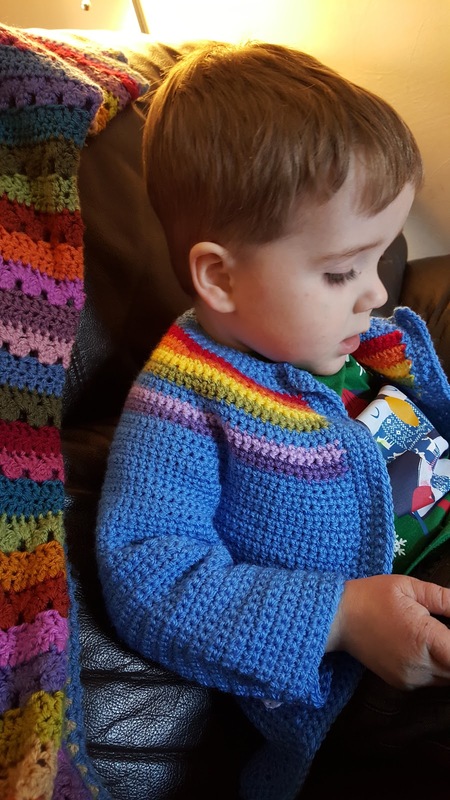 I didn't get far into making it when I realised there was a mistake in the pattern, my Instagram friends who were also making the cardigan confirmed this. So the week that I injured my foot, I emailed the magazine and received the corrected version of the pattern and started again. Because I was using DK and not the Aran weight yarn used in the pattern, I had to add quite a few extra rows to the length of the cardigan and, thanks to the advice of an Instagram friend who had completed the cardigan in DK before me, I didn't make any of the decreases in the sleeves. I just kept on trying it on Fraser and measuring it against him until the lengths of everything looked right! I also didn't add the cloud as it was in the pattern as it wouldn't have ended up sitting in the same place. 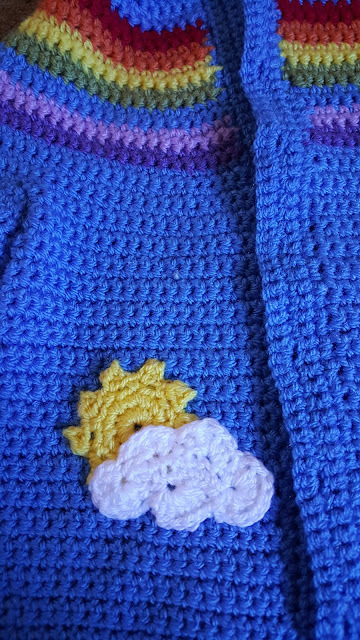 Instead I decided to add a sun and cloud applique. The sun motif is from Repeat Crafter Me and you can find the pattern for it here. The cloud motif is one I came across on Pinterest. The link didn't go anywhere, it was just a photo of the pattern, so I don't know who or where to credit it to, although it does remind me of the style of a page from Simply Crochet Magazine. You can find the pattern here. 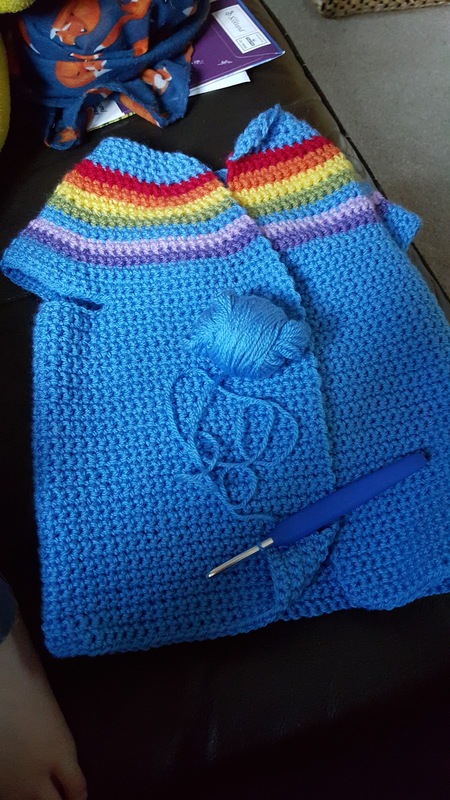 The crochet is all finished on it but I still haven't added any buttons. 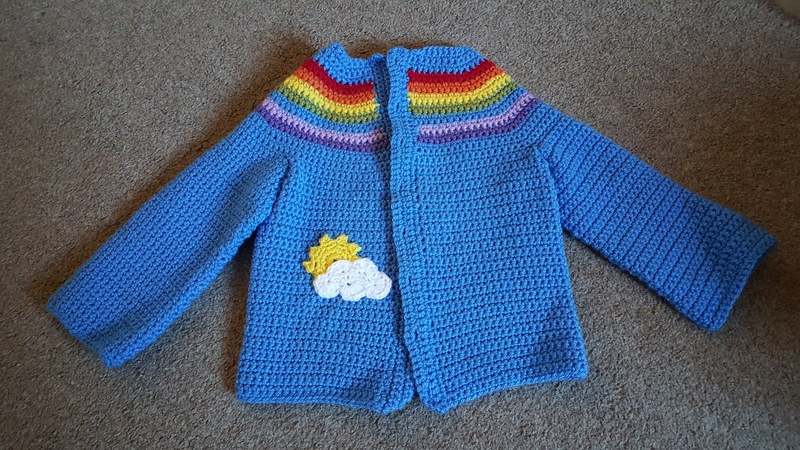 In my head I think it would look perfect with some little cloud or sun buttons, but I haven't been able to source any yet. If I can't find any then I think I'll use different coloured buttons, one from each colour of the rainbow. The hardest thing now is getting a photo of the cardigan on it's intended wearer - a 2 year old who is rarely still, even when sitting down! 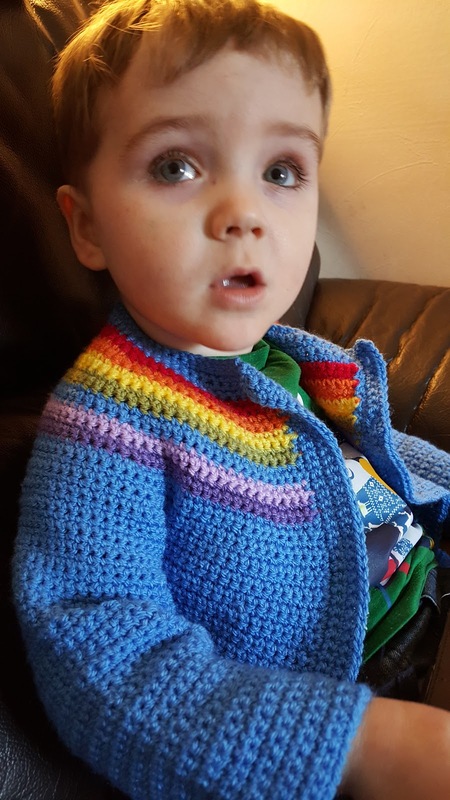 Perhaps I'll try and get a better photo of it on him once the buttons are all added on!